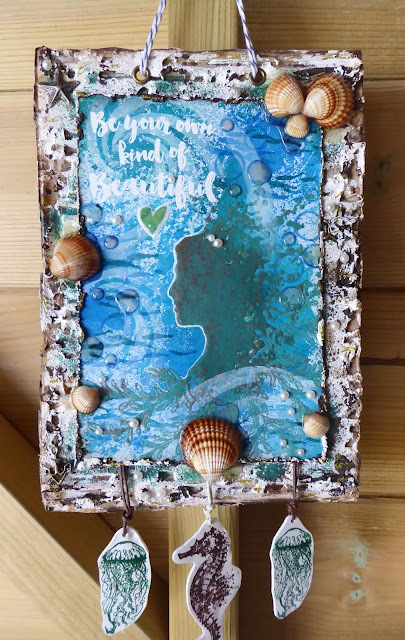 Good Evening, it’s time for my weekly Design Team make for Visible Image and today I am sharing an art journal page I have made for my holiday journal I am putting together after our recent wonderful Majorcan family holiday. Daisy and I loved collecting shells from the beach but most were tiny. I did spot some bigger ones in the sea. However we soon found that all of them had brilliant hermit crabs in them… so we left them be and made do with small shells to decorate the sandcastles we built. We even built a moat which Daisy filled.. but bless her she could not understand that no matter how many buckets of water she collected, no water stayed in her moat..bless! So my journal page had to feature crabs and the sea. 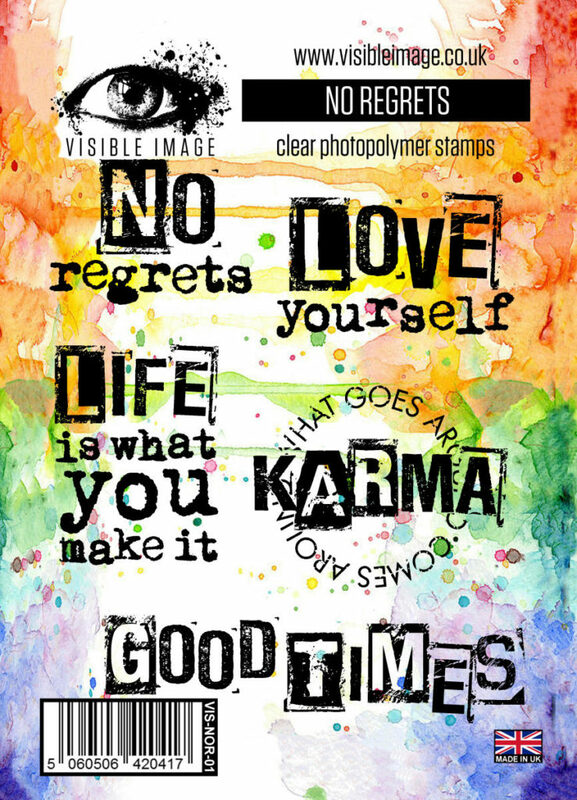 I reached for the brilliant crabs stamps from the Zodiac Cancer set to work with.. 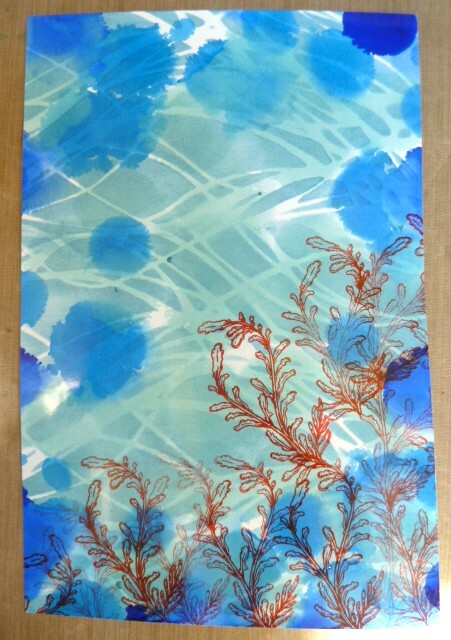 I used some “blue sea” distress inks and blended them onto some watercolour card as well as adding some “waves” and shafts of light using the ever versatile Fibres stencil on its side. and as Daisy loves to add wobbly eyes to things whenever she crafts with me I thought they would make a really fun addition to the crabs. Thanks so much for stopping by. The heatwave here continues and the heat over the weekend was quite incredible, it reached 36c on my patio and was far too hot to sit out in. I’m not sure how they managed to play tennis at Wimbledon! 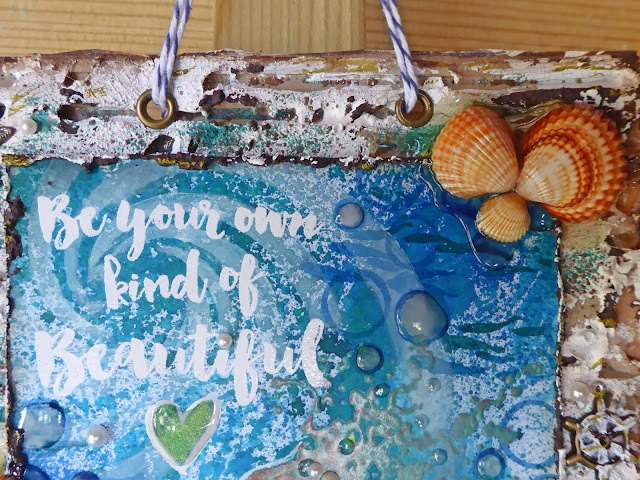 Fabulous page Jane… Thank you ♡ The crabs look brilliant.. love their eyes! We will be back tomorrow with preview #7 from our Wonderland release! If you have missed any of the characters revealed so far, check them out HERE! Phew it has been so hot that most of our minds have turned to thoughts of the seaside. 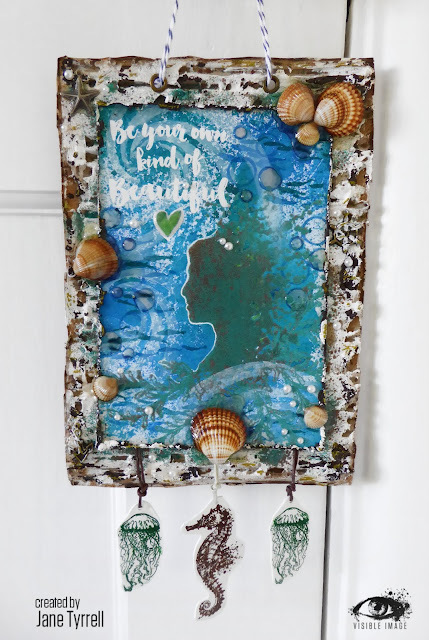 I decided that my garden studio needed a fantasy seaside goddess wall hanging. Now I know that you will say that there is no sea goddess Visible image stamp… yes I know that too.. but there’s nothing stopping me improvising one. After all I made a mermaid from the leaping Katie stamp! 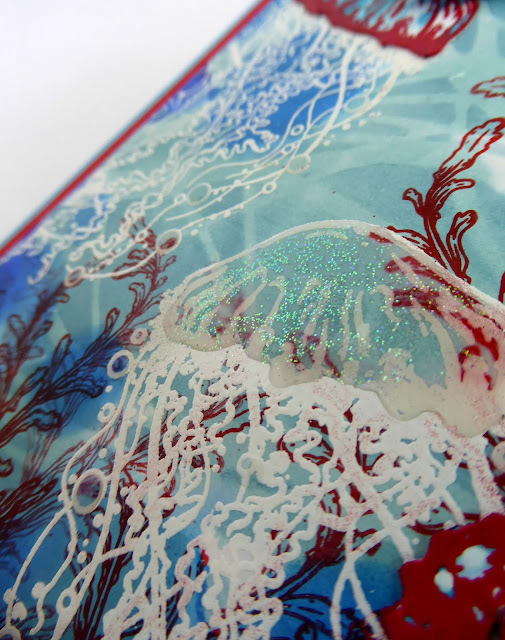 I over stamped and embossed them onto some watercolour paper using Seth Apter baked embossing powders to create my sea goddess. I love the colour mixes in these powders. Here is my finished wall hanging.. I made a mixed media frame for it from corrugated card… one of my favourite (and free) substrates. 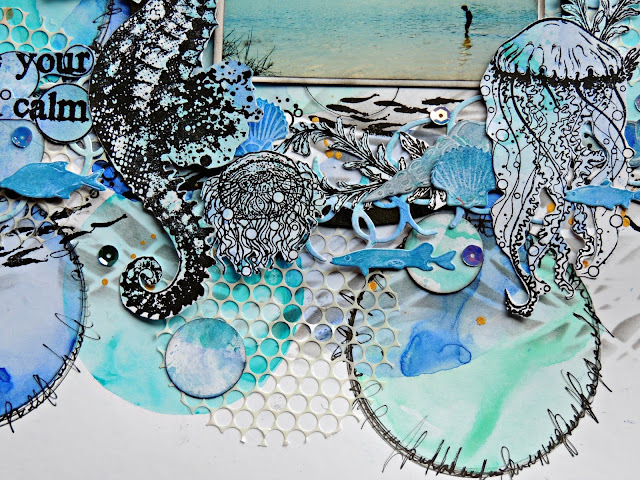 I used gesso, embossing powders, shells, metal charms, pearls and glossy accents. 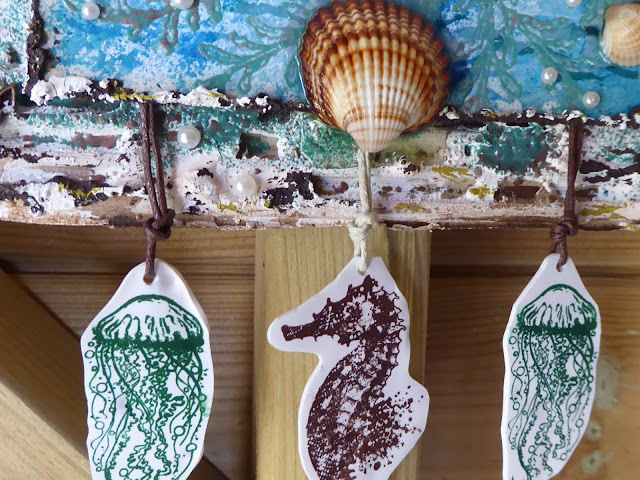 Here it is hanging in my studio..
You can see I used real shells collected from our seaside holidays over the years. 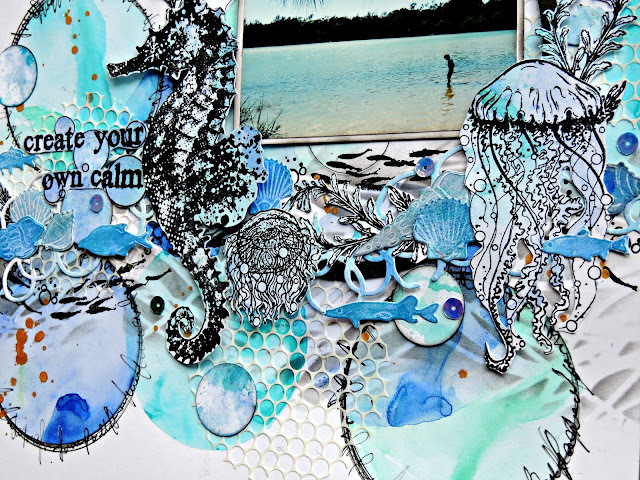 I added pearls and glossy accents to give the feel of the sea. and here is one more inside shot.. Thanks so much for stopping by and for your kind comments. The heatwave appears to still be with us this weekend… this is the first real summer we have enjoyed for some years here in the UK. 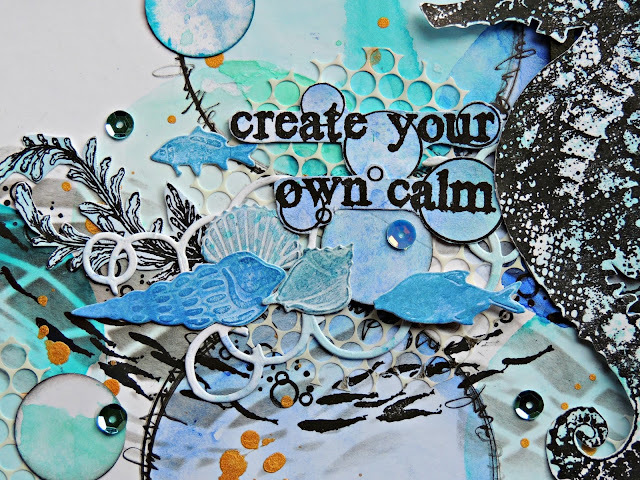 Keep cool and carry on crafting! Have you seen the first previews of our next release yet? We will be back soon with more beautiful inspiration and more previews from our summer release! Thanks for visiting our blog today, have a great weekend. 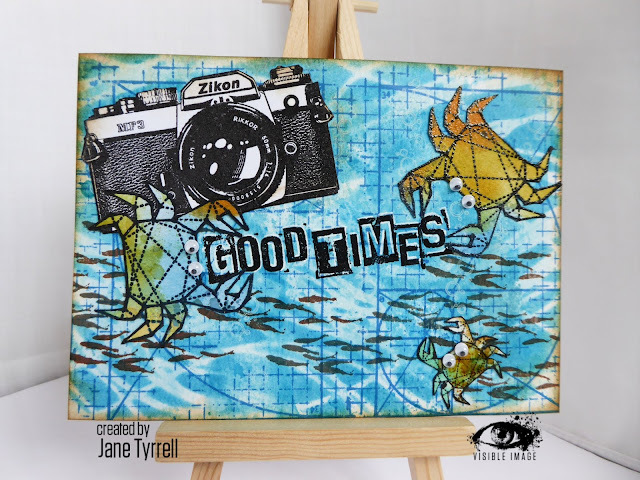 Elisa here from the design team for Visible Image with a layered mixed media layout featuring an underwater sea theme, utilising the awesome ‘Create your own Calm and Dare to Swim’ stamp sets as well as the ‘Fibres’ Stencil from Visible Image. 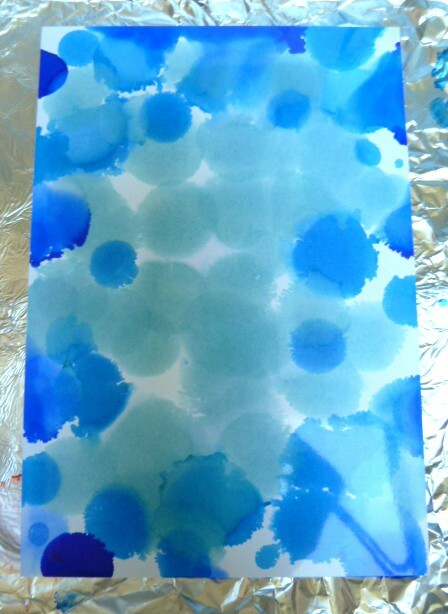 To create the background, I used a small petite gel plate along with Dina Wakely Scribble Sticks to create a watercolour ‘bubbly’ scene. 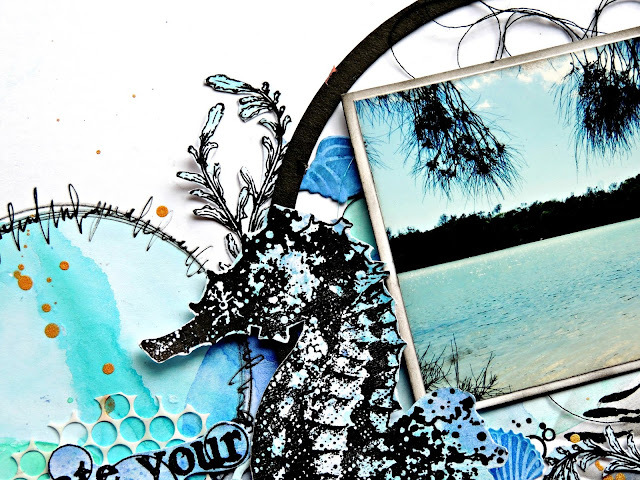 Add some stencilling and stamping and you can build a scene to suit your photo! 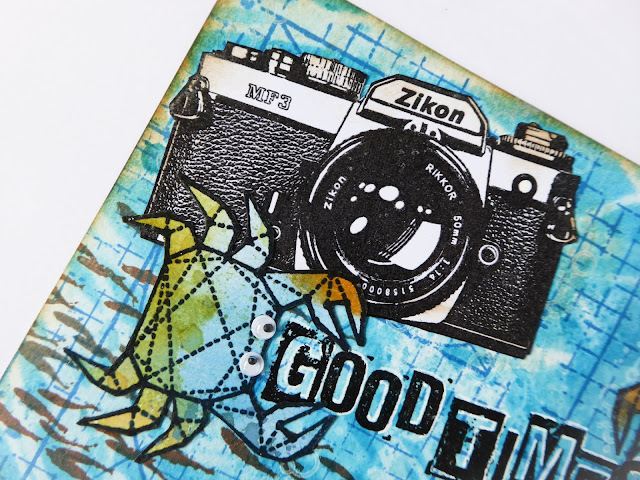 TIP – to draw your eye to the photo, create a ‘flow’ across your page using your stamps and stencils and then use key pieces such as the black circle and large stamped images to draw the eye to the photo. Here are some close ups of the finer details! Here is the product list from Visible Image, click on the images to head to the store ! This really makes you want to head to the sea! 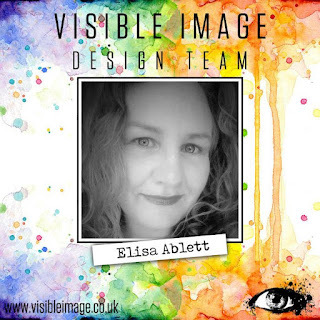 We will be back later with more gorgeous inspiration… and the first sneak peek of what’s coming next from us here at Visible Image! This is incredible Heather! 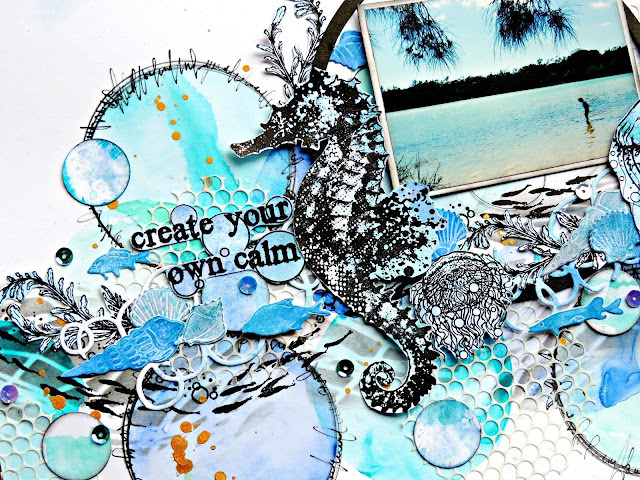 Your background is awesome… loving the ripple effect stamp with the seahorse!